This 3 bedroom house which spans over 3 floors is situated in Piazza. 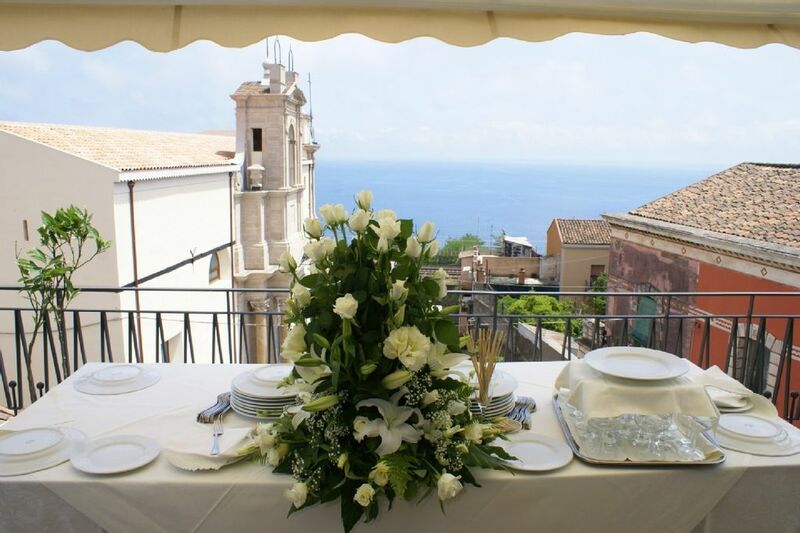 Madonna Suffragio with magnificent views of both a beautiful 400 year old church and the Med sea, is walking distance from the heart of Acireale, a 17 C baroque town bursting with beautiful historical buildings. 'Casa Aranci', built lately and recently refurbished, retains some of its original features and integrates within the square. The first floor is dedicated entirely to an en suite bedroom which also has a single sofa bed for a third guest. The second floor comprises of a double room and a single room both sharing a 'wrap around' style balcony and a shower room. The highlight of 'Casa Aranci' has to be the third floor which is the kitchen and dinning area leading out to a garden terrace which benefits from magnificent views of the sea. All rooms have air conditioning which can also switch to heat in the few cold winter nights between Nov and April. Catania, Taormina Mt Etna within one hour drive. Thermal Spa: You can take advantage of Acireale's Santa Venera Thermal Spa where past, present and future join for a special spa experience. In the heart of the city of Acireale, you can enjoy natural thermal waters closer to the very site where the Romans did over 2000 years ago. Santa Venera Thermal Spa is a day spa where you can bathe in the warm, natural mineral-rich waters and choose from a range of spa treatments designed to ease the body and soothe the mind. Excursions to Mt Etna: Etna volcano, the largest Volcano in Europe, towering above Catania, Sicily's second largest city, has one of the world's longest documented records of historical volcanism, dating back to 1500 BC. Historical lava flows of basaltic composition cover much of the surface of this massive volcano. The Volcano, truncated by several small calderas, was constructed during the late Pleistocene and Holocene over an older shield volcano. If you are a volcanoes amateur you can organise a trip to the top or take advantage of somebody, with high educational skill in geology and volcanology, that can lead you for some Etna excursions . We can organise for geologists and accredited guides to lead you trough the excursion of a lifetime. The excellent view from its terrace will make you fall in love with it as it did to us from the minute we set foot in it... It was, and it still is, like seating in the deck of a cruise ship; from dawn to sunset! The en suite bedroom has a spacious bathroom with bath tub containing shower. The shared bathroom on the 2nd floor comprises of a shower On the third floor there is a unique wet room style bathroom ideal for refreshing after a spell of sunbathing on the terrace. Only available on 3rd floor dining and terrace area. Because of the layout of Casa Aranci spanning over 3 floors, the house is not suitable for anyone with a walking disability. Please note that, as per common sense, whilst on balconies on the second floor and terraces on the third floor children should be supervised when playing outside. Part of the character in the piazza of St Maria al Suffraggio is the church of the same name, it makes for a wonderful backdrop from the terrace as seen in the photos, please also note that part of its charm is its bells !! just in case you forget to bring your watch don't worry you will be reminded of the time every 15 mins from 0600 to 2200 each day. Sundays is a particularly lively time for the church and its bells. With just enough updates to make the whole stay great. Great hosts made our stay a great experience. This house became very special to us as it's very welcoming ,homely ,tastefully decorated,well equipped and modern.The owners couldn't have been more helpful with advice about the area and tips on restaraunts etc.We loved Airiceale and it's people,buildings and culture.Its not as "touristy" as Taormina so we feel that we had a more "genuine" experience.Airiceale has restaurants,cafes,shops,historic churches and squares and very nice people.Prices at cafes and restaurants are very reasonable for delicious food(pizza,pasta,fish,meat),beers and wine. We would advise hiring a car after a day or two when you get more used to the narrow streets and the sometimes eyebrow and hair-raising drivers in Sicily.Casa Aranchi -great! Airiceale -great! Thank you so much for taking the time to write this review and for your honest suggestions that will be very helpful to future travellers. Your advice of having a driver from Acireale sent to collect you at the airport contributes to a more relaxed approach to your stay and renting a car after a couple of days to visit the several interesting places nearby reduces the cost of car rental as well. Paola was also delighted with your kind words and for you having taken the time to leave the house in such pristine conditions at check out. Thank you again and we'll be very happy to welcome yourself and your family any other time in the future. Eamon and Paola were very gracious hosts. We had everything we needed and more. The view from the balcony was beautiful and relaxing. Streets a bit tight but with Paola’s help we managed and it only added to the charm!! We’re glad you all enjoyed Casa Aranci (and its terrace in particular) and took to the “charm”, as you described it, of the narrow streets and alleys of the old part of the Baroque town of Acireale. Paola will also be delighted with your comments. We’ll be very happy to welcome you anytime in the future. Streets are narrow so small car is good. Trip to Mt Etna was interesting. It was a pleasure to have you, Paola really enjoyed trying to make your stay comfortable. We're glad you mentioned the narrow streets of the conservation area where Casa Aranci is situated and the necessary avoidance of bigger vehicles to reach it; that's the reason we recommend the parking lot nearby in those cases. We'll be very happy to welcome you anytime and we'll "taylor" your transport needs next time! A lovely property with terrific balcony and views. Very spacious and characterfull. Eamon was helpful in emailing us lots of useful information before our arrival. When we contacted him during our stay he was quick to respond. So a very good stay in a spacious apartment, the church bells were a bonus! Many thanks. Paola who saw us in was on hand across the road if you needed anything, she only speaks Italian which is logical as we were in Sicily! Great fun! Paola will be delighted to hear and we’re glad you considered the very rooted Sicilian tradition of telling the time through the church bells during the day as a bonus! Your review will be very useful to future guests of Casa Aranci. Thank you again and we look forward to welcome you in the future for another family holiday experiencing Sicilian food and sights. The place is very nice and very spacious. Paola was very welcoming. The home was in a perfect spot. We explored Acireale the first day. There is a lovely nature walk only steps from the casa. We ate a few local restaurants and none disappointed. La Locanda di abbatizza(4min walk) was our favorite. We also took day road trips to Catania and Taormina once again the casa was in the perfect spot to do so with out driving forever. We would definitely stay there again when we come back. Thank you so much Dominic! It was a pleasure to have you and your beautiful family with us, Paola is very grateful of your comments as well. Thank you also for your review of the restaurants nearby... it’s always helpful for future guests. You’ll be very welcome next time you visit! we suggest you drive mostly along the coast following directions to the main port and train station in Catania and then the small port of Ognina. Follow signs for Acicastello, Acitrezza, Capomulini and then Acireale. Follow directions for Acireale Nord and enter the city by the communal gardens of Villa Belvedere, drive along Corso Italia and turn left into Corso Savoia to Piazza Duomo, drive under the arches (via Monsignor GenuRdi) next to the church and turn left in via Galatea, some 30 metres ahead turn right on via Marzulli, another 30 metres on the right turn into via Aranci and follow the road down to Piazza del Suffragio where Casa Aranci is at number 40... if you find it difficult to negotiate the narrow street of the neighbourhood you can go on driving Via Galatea another 100 metres to the big car park just before the church in Piazza Cappuccini. Low season rates may vary around the Christmas, Carnival and Easter.